Errors and delays on renewing car insurance can lead to cars not being listed on the national Motor Insurance Database, opening drivers up to being stopped by police, says AA Insurance. But the askMID website is a quick and easy way to check whether your car is on the Motor Insurance Database, which is cross-checked with the DVLA database to identify cars that might not be insured, yet most drivers are unaware of this free service. The AA is urging drivers to use the quick and easy online check. Ninety three per cent of drivers have never checked whether their car is correctly listed as insured on the Motor Insurance Database (AskMID), which is now being used to compare insurance records with DVLA data, under new continuous insurance rules. National TV advertising by the Motor Insurers' Bureau and leaflets sent with tax disc renewal reminders promoting the new Continuous Insurance Enforcement (CIE) rules and the AskMID checking website, seem to have done little to raise awareness of the free service. Simon Douglas, director of AA Insurance , says that the lack of awareness is disappointing given the importance of the new rules which make it a requirement that every car must be continuously insured, or registered as off the road with the DVLA using a Statutory Off Road Notification (SORN). He points out that the police use data from the MID to operate their automatic number plate recognition technology which alerts officers if the equipment 'spots' an uninsured car. "Simple errors on insurance details, such as using an 'O' instead of a zero or two characters transposed - can result in a mismatch so it's important to make sure the details are correct. "Similarly, if you delay renewing your cover to the last minute it could result in your car's details 'dropping off' the database for a short time," he says, pointing out that it can take two or three days, or even longer if there are queries to sort out, before insurance changes are uploaded to the MID. "Using the AskMID website couldn't be simpler. Putting in your car's registration number brings an instant response that either confirms that it is insured with its make and model, or a warning that it is not. 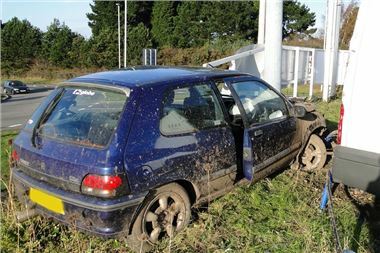 "If you know you have cover but the car is recorded as being uninsured or the details are wrong you must take it up with your insurance company urgently," he says. "It is also really important to renew your insurance or take out a new policy well before your cover expires and then make sure the details are correct. If your car isn't on the MID or it's wrongly listed, you risk being stopped by police or getting an unpleasant letter through the post." CIE (Continuous Insurance Enforcement) was launched in June 2011. DVLA and MID databases are now being compared and registered keepers of uninsured vehicles are being written to and warned to insure or register their vehicle with a SORN. If no action is taken a series of escalating penalties can apply from a fixed penalty notice and a £100 fine to court prosecution and a fine of up to £1,000; and clamping, siezure and disposal of the vehicle. Around 242,000 offenders are convicted for driving without insurance every year. About 1.4m vehicles are believed to be being driven on Britain's roads without insurance (source: MIB).